Paint the peacocks black because Eileen Brennan is gone. Well Lerlines. It’s happened. 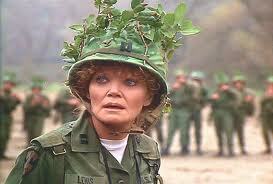 The amazingly talented, funny, and totes hot Eileen Brennan is dead at 80. Her online obits are all touting the Oscar nomination she earned for her role as the perpetually seething Captain Lewis in Private Benjamin. The difference between you and Eileen, girlie, is she makes that tree hat look good. But we all loved her most as Mrs Peacock in Clue, and the fact that she wasn’t nominated for that role is a crime against comedy. Also, her soup spoon should have won a Proppy. Also, there should be an award called The Proppy. Remember when I said she was totes hot? I wasn’t just whistling Dixie. No one, and I mean no one, can fake French like Miss betty DeBoop of the hardboiled, star-studded comedy The Cheap Detective, which should definitely be on your Slumber Party movie list if it is not already. So now, in honor of Eileen, all the songs I sing today will be in la la la la form. Try it! It really works for Down by Jay Sean. Oh, and Lose Yourself by Eminem…of course.